All correspondence concerning the above will ONLY be done via PM. I will NOT reply back to this post. Last edited by senbonzakura on Fri Apr 09, 2010 1:38 am, edited 1 time in total. I can trade most items in the game for these. I have shards, heart scales, fossils (or fossil Pokemon), certain TMs not listed, and Master Balls (4 of them). I can even trade Pokemon you're looking for (within reason). I will negotiate deals if you PM me. Master Balls will be traded 1 for 1 "urgent" TM and 1 for 3 other TMs. P.S. Don't tell me where I can get these TMs. I've had most of them and accidentally wasted them on crappy Pokemon. Last edited by electroccute on Fri Apr 16, 2010 3:48 pm, edited 7 times in total. Trade's completed thanks to Jun XIII. In the future I will edit this post with more trades. WANTING: RIOLU. MUST BE MALE! Last edited by PoisonMoth on Thu Apr 15, 2010 9:57 pm, edited 1 time in total. pokemon giving away: ALL STARTERS, ALL LEDGENARYS, AND OTHER RARE POKEMON. pokemon i want: magikarp lots and lots of them! behold the power of dragons! or how about getting that pokemon of your dreams? The guy above - S.h.i.n.y.m.e.w. - has hacked pokemon. So if you don't want hacks, don't bother. Anyway - looking for a legit UT Groudon and UT Kyogre. Also a UT Manaphy. Offering - ? ask and I might be able to make it happen. Last edited by MallratDogma on Sat Apr 17, 2010 12:25 am, edited 3 times in total. ....lol you funny... i dont hack my pokemon. 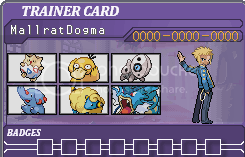 I mearly modrate them.. there DV's, EV's, nature, abitily and such are still random and set to what they should be. a hacked pokemon would have ev's of that above the 510, a hacked pokemon would have a different abitily from what it should have. I dont hack my pokemon i just let others get a chance of EV training. the levels are random so what.. at least you get them.. Need you to keep everything besides what you want/offering in this thread. Shinmew hopefully will respond via PM. PM me for details on specific pokemon. Last edited by WirelessBrain on Fri Apr 16, 2010 11:05 am, edited 2 times in total. for more details just PM me. Last edited by electroccute on Fri Apr 23, 2010 1:45 pm, edited 3 times in total. Last edited by AlphaArceus on Tue May 04, 2010 1:43 pm, edited 3 times in total. Adamant level 98 (from 70-98 using rare candy) Adamant Groudon. UT Shaymin (with "met at fateful encounter") Real or Data Trade. Attached with TM or Item of your choice depending on request. If just Data trade I will offer a random pokemon with your requested TM/Hold Item attached. If I have something you really want or need, just make an offer. I need a Kyogre to get the Green Orb. Is there something you need for the Dex that could be trade-backed for the Kyogre after I get the Orb?